ROOT , RASHID AND MORGAN LEAD ENGLAND TO 2-1 SERIES WIN!! INDIA TOUR OF ENGLAND 2018. ODI SERIES 3RD ODI VENUE : HEADINGLEY , LEEDS. DATE : 17TH JULY 2018. Both the teams headed off to Leeds with one same aim! Win the deciding ODI and seal the series. Bright sunny day at Headingley it was! England winning the toss elected to field first. English bowlers started beautifully with Mark Wood sending back Rohit Sharma … Continue reading ROOT , RASHID AND MORGAN LEAD ENGLAND TO 2-1 SERIES WIN!! JOE ROOT AND DAVID WILLEY LEAD ENGLAND TO LEVEL THE SERIES!! INDIA TOUR OF ENGLAND 2018 2ND ODI VENUE : LORDS, LONDON DATE : 14TH JULY 2018 The Lads moved on to London for the 2nd ODI which was scheduled to be played at Lords! The boys were obviously looking forward to bounce back and most importantly try and solve the Kuldeep mystery! England winning the toss decided to bat first! We started off nicely with our … Continue reading JOE ROOT AND DAVID WILLEY LEAD ENGLAND TO LEVEL THE SERIES!! KULDEEP, ROHIT LEAD INDIA TO WIN IN THE FIRST ODI! INDIA TOUR OF ENGLAND 2018 ODI SERIES 1ST ODI VENUE : TRENT BRIDGE , NOTTINGHAM. DATE : 12TH JULY 2018. 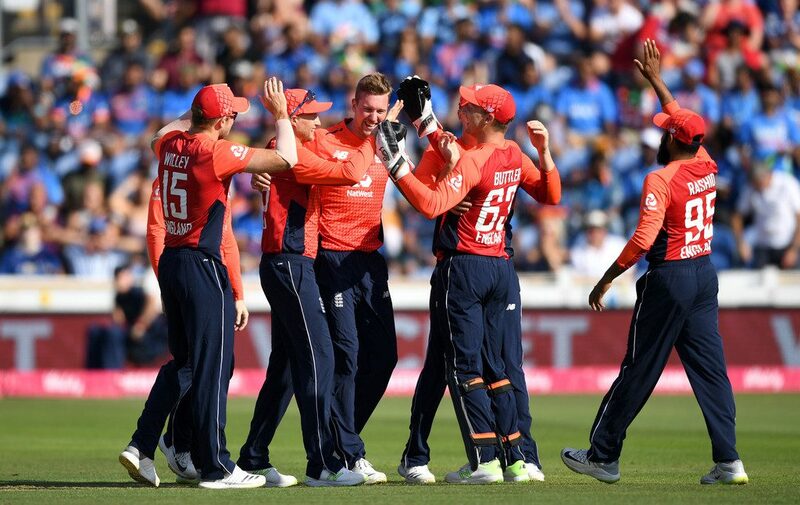 Just a month ago at Trent Bridge England registered the highest ever ODI score breaking their own previous record, the boys were again ready and much desperate to start fresh here after their 2-1 defeat against India in the T20I series last week. India won the … Continue reading KULDEEP, ROHIT LEAD INDIA TO WIN IN THE FIRST ODI! INDIA WON THE DECIDING T20I AND TAKE THE SERIES 2-1! INDIA TOUR OF ENGLAND 2018 ENGLAND V INDIA 3RD (D/N) T20I DATE : 8TH JULY 2018 VENUE : COUNTY GROUND, BRISTOL. After England winning the 2nd T20I and leveling the series 1-1, both teams now were aiming to win the deciding and final T20I and win the series. The toss happened at a fully packed county ground in Bristol! India elected to field first … Continue reading INDIA WON THE DECIDING T20I AND TAKE THE SERIES 2-1! INDIA TOUR OF ENGLAND 2018 ENGLAND V INDIA 2ND (D/N) T20I DATE : 6TH JULY 2018 VENUE : SOPHIA GARDENS, CARDIFF. England much desperate to win this game to level the series while India wanted to seal it off! Both the teams had arrived in Cardiff with their respective aims and Started preparing! Sophia Gardens was all lit for the 2nd and much awaited game! … Continue reading ENGLAND UNBEATEN AT CARDIFF! KULDEEP’S MAGIC SPELL STUNNS ENGLAND! INDIA TOUR OF ENGLAND 2018. ENGLAND V INDIA : 1ST (D/N)T20I DATE : 3RD JULY 2018 VENUE : EMIRATES OLD TRAFFORD MANCHESTER. After their 6-0 victory against the Aussies ( Link for ENG V AUS review : ENGLAND GOES 6-0 OVER THE WORLD CHAMPS! ) our lads moved on to start the series against India with the 1st T20I at Manchester. Old Trafford it was again , … Continue reading KULDEEP’S MAGIC SPELL STUNNS ENGLAND! ENGLAND GOES 6-0 OVER THE WORLD CHAMPS! Here well see everything that happened in the recently concluded #EnglandvAustralia ODI/T20I series… Lets see how our people performed throughout the series making and breaking all the records and setting all the record books absolutely on fire! 1ST ODI : – What a fantastic start to the ODI series it was at Kia Oval! The game dominated all the way by the English bowlers as … Continue reading ENGLAND GOES 6-0 OVER THE WORLD CHAMPS!